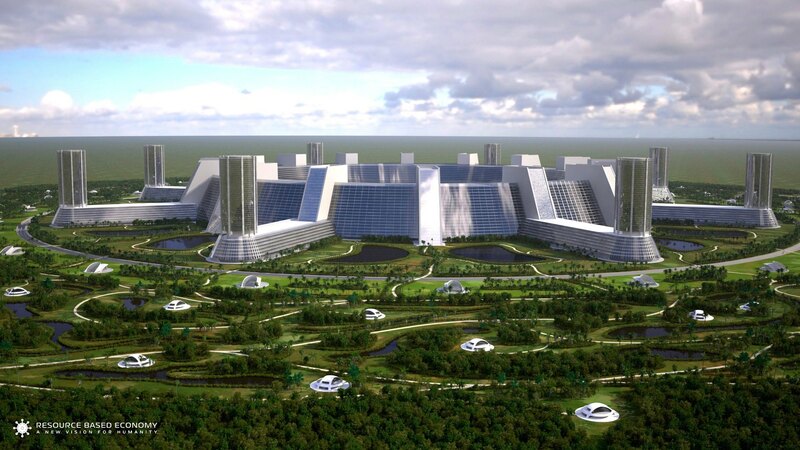 The first prototype city will cover two square miles (about 5.2 square km) and require flat land. A tropical or subtropical location is highly preferred to take maximum advantage of solar energy, along with other methods of clean energy sources. Good roads to the location, international airport, industries for building materials and fabrication plants should be accessible. The outer perimeter is part of the recreational area, with hiking and biking trails and opportunities for water sports. This sector also provides clean, renewable sources of energy such as wind, geothermal, solar and heat concentrators, and whatever else may be appropriate to the environment. Moving inward is a waterway surrounding the agricultural belt, with both indoor and outdoor agriculture. Next are the two rings containing the residential districts; high-rises and homes. Each of the high-rises is equipped with dining areas, childcare, hobby shops, meeting facilities, recreation, medical care, and entertainment. Both residential districts feature beautiful landscaping with lakes and winding streams. A wide range of creative, innovative apartment buildings and individual unique homes will provide many options for the occupants. Adjacent to the residential district are the art, music, exhibition, entertainment, exercise and conference centers. 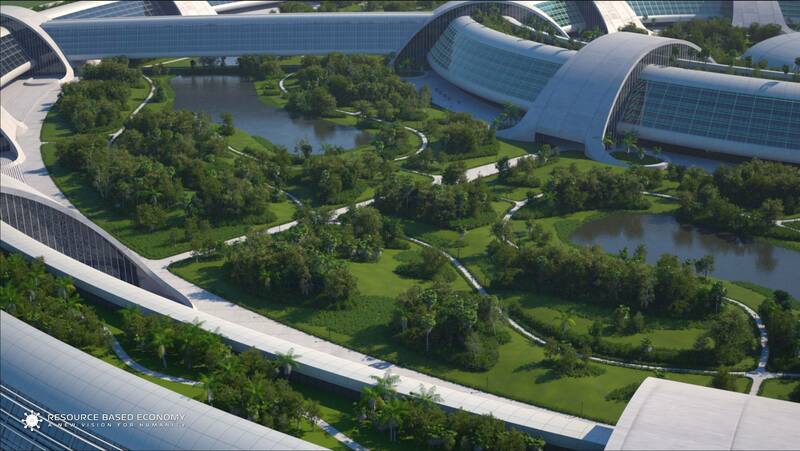 Toward the city center are the research labs, childcare, science, and educational facilities. The eight smaller domes surrounding the large central dome host the access centers. The central dome, or theme center, contains healthcare, communications, networking, central planning, and orientation center. It also serves as the hub for most transportation services, which move people by trams anywhere within the city, and by monorails from city to city. This minimizes the need for automobile transportation, except for emergency vehicles. Using satellite communication systems and geophysical feedback will allow anyone to access on-demand information pertaining to weather, agriculture, transportation, city operations, and much more. Research and Development – at these facilities, researchers will work towards positive, collaborative living scenarios, both local and, ultimately, global in scale. The research results and products will be directly applied to the city, where every citizen will participate in short- to long-term tests to demonstrate feasibility. Education – Learning Centers will provide relevant education and a constructive environment from which to generate and teach values that promote conserving ecological balance. Long-term visitors will study how the Resource Based Economy system works; behavioral sciences, the elimination of scarcity, resource management, the improvement of the human condition, various fields of science and technology, media presentation, preservation of the environment, and methods toward bridging the differences between nations and people. Media Centers – Media plays an important role in teaching new ideas and constructive approaches to solving problems. We will develop magazines, videos, documentary films, animations, and positive gaming, as well as virtual & augmented reality environments to present and introduce this new social direction for society. Some claim that limited resources prevent us from achieving a society with a very high standard of living. This is simply not so. We still have more than enough resources to achieve a very high quality of life for everyone. But it’s time to move beyond failed programs and frustrations. The carrying capacity of the Earth can be increased if we allow innovation to flourish. Innovative solutions can be applied now if we direct our attention to overcoming scarcity. We have the capability to intelligently apply humane science and emerging technologies to provide for most human needs and to reclaim and restore the natural environment. Fossil fuels such as oil and coal have allowed our civilization to progress to its present state of development. However, these energy sources are limited, non-renewable, and pose what may be insurmountable environmental threats. In designing this innovative city, we must harness new methods for generating energy where applicable. These include wind, wave and tidal power, ocean currents, deep ocean pressure and differentials, falling water, geothermal in both land and ocean, electrostatic power, hydrogen and natural gas, algae, bacterial, piezoelectric, phase transformation, and thermionics. Additionally, there is the untapped potential of Fresnel lenses developed for use as optical concentrators in solar power systems, and much more.